I've had many people tell me over the years that shooters are "dumb," because these people believe that shooters are simple games about pointing at enemies and clicking on them until they die. I don't think that's true. This has been a great year for shooters, many of which have a lot more going on beneath the surface. In fact, the more time I've spent playing shooters, the more I've realized that the best shooters share some common traits. Every genre has its own building blocks. 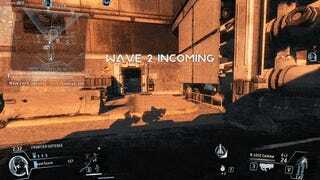 In an FPS, the player uses a first-person camera to navigate the game world and a weapon of some kind to shoot the enemy. Every first-person shooter has that, but some shooters do a lot more. It's the difference between a styrofoam cup with ramen noodles in it and a steaming bowl of miso ramen with eggs, meat, onion, corn, and a bunch of other ingredients. Plain styrofoam cup ramen is boring, just like a plain shooter is boring. It isn't until you add the other ingredients that the ramen becomes an awesome dish. That said, just as there are many types of ramen, such as miso or tonkotsu, there are many types of FPS. 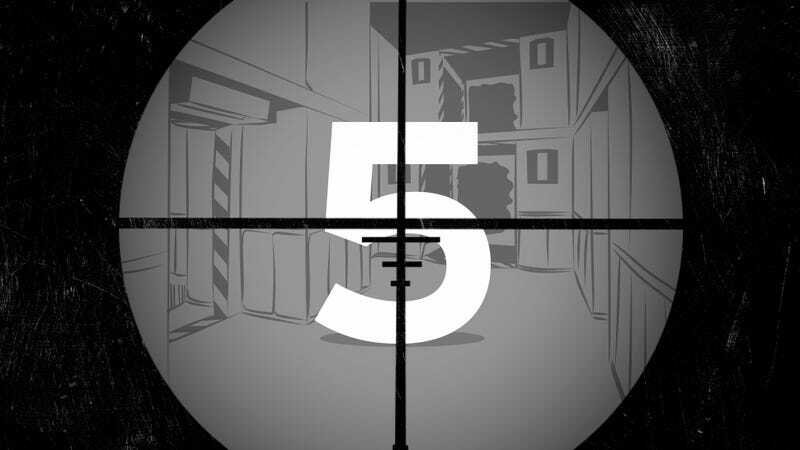 Players approach a tactical shooter like SWAT 4 with stealth and consideration, whereas games like Serious Sam push players to unleash their entire arsenal on hundreds of enemies, often within a very short time span. So, while the following ingredients can be found in great shooters, they work for some games better than others. What's more fun to watch: a person running on a flat surface, or a trained athlete doing parkour? Shooting's a bit like that. It's more interesting when your movement through the game world is part of the fun. [or, perhaps] It's more interesting when your virtual legs have something exciting to do, too. It's one thing to be able to climb a ladder. It's another thing to jump, then activate a jetpack, and jump a bit higher, maintaining forward momentum while gaining height. Likewise, being able to quickly sidestep enemy fire, slide under a barrier to reach a hard-to-access spot, and wall-run all make for a more engaging game. Movement has been prioritized in the genre from the very beginning. Take Doom, a game focused on fast movement that enabled players to strafe past damage, or Quake and Unreal, which allowed forms of dodging and wall-jumping. With the advent of "realistic" shooters, this emphasis on movement was lost in favor of more cover-focused play, but shooters became shooting galleries as a result. 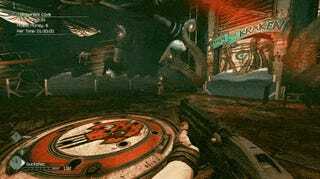 Recently, games like the excellent Shadow Warrior have re-emphasized movement and dodging. Not every game needs to make you a super wall-running ninja, of course. They just need to make movement interesting. Titanfall's movement is wonderful. The game lets you double jump, wall-run, and mantle over walls. That boosts the speed of the game while making shooting a lot more interesting. It spices up movement, making it more interesting, and allowing us to engage with the map in a lot of creative ways. Now, instead of wondering if we should run around a building to the right or left to flank an enemy, we're thinking about leaping over it, wall-running around and shooting from the opposite side, sliding through a hole in the wall, or any one of a dozen other tactics. Movement just got a whole lot more interesting. Part of me wonders if this generation of video games will be marked by double-jumping. Titanfall had it, Destiny went so far as to give Hunters a triple jump, and Call of Duty: Advanced Warfare is going to include its own form of double-jumping. Even Borderlands: The Pre-Sequel had a double jump, and a slam attack as well. It's a whole lot of nothing. But it doesn't have to be this way. When we think about shooters, we tend to think about guns, but before we ever get to the "shooter" part of FPS, we have that "first-person" bit to deal with. Before we get a gun, we're given a perspective to use and a space to walk around in. In other words, where we fight shapes how we fight. In their director's commentary entries in the Half-Life 2 games, the developers at Valve express how important it is to feature verticality in level design. In a shooter, players can move forward, backward, side to side, up, and down. Seems pretty simple until you realize that most current shooters feature combat on a relatively flat plane with enemies who keep their distance. In other words, most shooters are about moving forward while aiming side to side. Good shooter design should encourage players to do more than that. As a result, you need level design that empowers and entices you to move. It's one thing to be able to wall-run, strafe, or double jump, and another thing entirely to have levels that actually encourage players to do that. One of my favorite rooms in recent years is the "Sword of Crota" room in Destiny. It's filled with columns, set on multiple levels and has a series of enemy spawn points set throughout the room. One advantage of this is that enemies can flank you, but the counterpoint is that they can also hide from you, which means you've got to actively hunt them down rather than simply letting them come to you. This requires more engagement from you, the player. Engagement is the texture and weight of a game, the thing that draws you into the experience. Dark Souls is a game that's all about engagement. Instead of just mashing the X button to attack your foes, you have to think about engaging them. Good shooter level design is the same way—it's all about keeping you thinking about the combat. It's about giving you quality time with your enemies. A good shooter enemy's job is to move the player around the map. Don't believe me? Imagine an enemy that stands still and accepts your bullets; you shoot it, and it just sits there without responding. How boring is that? What about an enemy that dies as soon as you click on him? He'd be boring, too! Either enemy is like a bad tug of war opponent—you don't want an opponent who lets you pull the rope without resistance, but you don't want a rope that refuses to budge either. For tug of war to be fun, you need enemies who have a bit of give and take. Now think about a good shooter enemy, one you've enjoyed fighting. For me, it's guys like Halo's Elite, an enemy who gets in close to punch me in the face, that make the game fun. When I face a guy fully intent on bisecting me with a sword, I backpedal, wildly firing my shotgun in an attempt to maintain distance between us. One of my favorite things to do in a game is to throw a grenade at my foe, manipulating him into, say, jumping off a cliff or avoiding my grenade only to run into my stream of bullets. 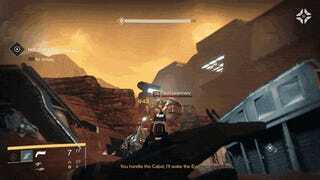 One of my favorite kills in Destiny involved baiting a phalanx into charging me, only to leap out of the way and let him run directly into a tripmine grenade, which exploded, killing him. Some enemies, like Wolfenstein's armored shotgun troopers, are best flanked before they're killed, much like Halo's hunters, who have weak points on their backs. With enemies like that, the vulnerabilities encourage players to move around the map space just as much as the gunfire they're dodging. Destiny's phalanxes are similar, with impenetrable shields that can turn some encounters into impromptu bullfighting matches. Enemies should be tough but also work to make you utilize the movement mechanics and the map you're in—in other words, enemies are about pushing you to use all the elements of the game. They're not fodder to be pointed and clicked on. They're environmental hazards to move you through the space in interesting ways. Good enemies encourage movement, pushing players around the map. If enemies push us around the map through threat of damage, then our gun is what pulls us to them. A shooter's guns should look cool in our hands, should sound amazing, and should help us engage with the game space. One of the things I love about Destiny is the detail put into some of the guns, particularly The Last Word, an exotic revolver. 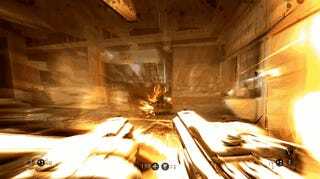 Your character's hands twirl the pistol around when switching to it and fan the gun to fire it; the result is a glorious camera shake that conveys the sense that the gun is crazy powerful. Even firing it in an empty room the gun itself looks like it's powerful. When you pull the trigger, The Last Word looks like it's unleashing hellfire on your foes. Video games are limited in their ability to create haptic feedback—that is, you're not actually firing a gun and feeling its recoil in your hands, you're pressing a button and watching your character fire it. So a lot of attention has to be paid to the way the gun acts in order to make it feel as if you're holding it without actually doing so; unfortunately, too many games simply have a bit of recoil and leave it at that. Now imagine seeing all this cool stuff happening… and discovering that your gun sounds like a nerf toy. The other night, I watched John Wick (spectacular film; best action movie I've seen since The Raid), and came away surprised at just how good the guns sound. They're rich and meaty, and not many shooters feel the same way. Fortunately, Wolfenstein: The New Order's guns have the right amount of thunk to them. The mechs in Titanfall, which I've recently returned to because of its new horde mode, sound glorious. 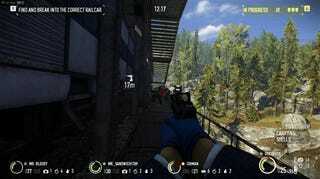 Payday 2's Stryk pistol, seen above, has a wonderful rat-tat-tat sound. I think people traditionally consider weapons as having a correlating enemy type, like how Shadow Warrior's flamethrower is great for groups of small enemies, but not a great choice against a boss. This is true, but I think there's a bit more to it than that. The best shooter weaponry helps us move around a combat space. Halo's ineffective-at-range MA5B helps pull players close to Elites, encouraging a duel of punches. Sniper rifles encourage us to seek high vantage points. Shotguns are all about close quarters combat. Needlers benefit from strafing. On and on it goes. The modern shooter approaches rewards with fancy popup messages. Oh, you shot that guy? Neat, he'll keel over, and while he does, here, have 500 XP. Oh, you shot many guys? Here, have a new skill point. Now you can shoot guys more efficiently. It's dull and repetitive, yet this is what games like the Borderlands series focus on. I've watched early footage of Gearbox's next game, Battleborn, and so far, it looks much the same way. The user interface stands in for what the game itself should be doing, and as a result, combat doesn't feel nearly as good as it should. That you are using guns doesn't seem to matter in these games; never mind that you're shooting enemies. The progress you make is shown through the game's user interface, but it doesn't have to be that way, because of a little thing called feedback. I recently started replaying Rage. Look at how this mutant stumbles when I shoot him! This is feedback. With a good shooter, there's a sense of progress and impact. You are here, now, doing things, and your actions matter. Other games, like F.E.A.R., do this with huge clouds of blood and dust when enemies explode. Games like Rage or Destiny have enemies that flinch and stumble when shot. Since the beginning of the genre, however, one method of feedback has reigned supreme: gibbing. A gib, pronounced 'jib,' like 'giblet,' is a kind of kill where the enemy explodes in a meaty shower of viscera. It's a wonderful explosion that practically screams to the player "you connected!" without sending the message. It's shorthand for an idea, another means of progress. In writing and filmmaking, there's this idea of "show, don't tell." The idea is that moments in time stay with us longer than explanations. It's much more meaningful to watch something occur than to have someone tell you that it did. Well, a gib shows you that you shot someone, where an XP popup simply tells you. 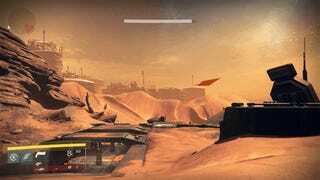 Destiny provides excellent feedback, but it also presents needless user interface clutter. Enemies stumble, visibly take damage, and die dramatically, which is great. There's no need for health bars or any kind of on-screen messaging telling us enemies that have died—the game's already showing us this! It's a flaw the game's otherwise wonderful feedback. 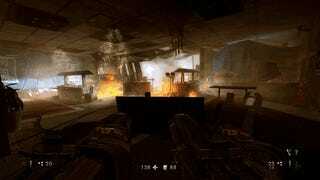 It wasn't until Wolfenstein this year that I realized how much I missed gibs. There's nothing quite like storming through a Nazi compound, blasting at enemy soldiers with shotguns while they explode in a shower of gore. Gibs aren't the only kind of feedback games rely on. Some games, like Halo, emphasize your presence through the use of physics: a smart toss of a grenade sends your enemies flying, accompanied by a wonderful thumping sound and the screams of your foes. The game provides quick access to grenades, and gives you something like eight grenades to throw. Guns like the needler cause explosions. Elite and jackal shields pop in a bright flash after taking enough damage. Other games, like Half-Life, feature glass shattering, F.E.A.R. launches clouds of dust and debris into the air, and Crysis (as well as its sequel, Warhead) lets both players and enemies shoot trees and buildings so full of holes that they collapse in on themselves with far more detail than any other game on the market. Equally important is the use of sound. One of the best parts of F.E.A.R., which I revisited earlier this summer, was how the enemy combatants would shout things like "he's too fast!" or "I need backup!" If an enemy's silent or his words—or barks, as they're called—seem disconnected from the action, the game loses its sense of impact. Having enemies who seem aware of what's going on, like a Grunt screaming "I see bad guy!" in Halo. 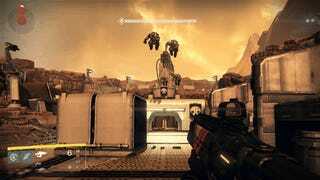 Even the smallest things matter in games like Destiny, which has a brief, subtle screen flash whenever the player picks up ammo or items, letting them know what to do without distracting from the combat. Having some text pop up to let you know that an enemy has died is like having someone sitting next to you saying "he died" any time you defeat a foe. An enemy that explodes in a cloud of crimson is a lot more fun to watch, a celebration of your presence and skill in the game's arena. By now, I'm sure you realize how these five ideas are connected: they're all about encouraging players to interact with a space, then giving meaning to that interaction through a sense of impact. When stuff explodes and enemies are eliminated and new resources are gained, it matters. Good shooting feels like you're actually doing something rather than simply ticking off boxes. A good shooter isn't about pointing and clicking on dudes any more than a hammer is all about putting boards together. Sure, that's what it does, but a hammer's purpose is to, say, build a house to live in, or a chair to sit on. If you just hammer random boards together without purpose, you're unlikely to build anything interesting. Likewise, a shooter's about engaging in a tug-of-war between you and an enemy in a virtual space, even if it works by pointing and clicking on dudes. Shooters these days, the boring ones at least, have given us enemies who only show impact through health bars. They absorb damage until they decide to die. They occupy combat spaces that pull us forward because of the promise of more XP or leveling up. Too many shooters these days are about engineering fun through the psychology of the Skinner Box rather than through fun play. A bad shooter is like a bowl of cheap ramen, or the product of a hammer used without purpose. A good shooter, on the other hand, is like a great bowl of savory ramen, or a house built by a master carpenter. This year, I got to dive back into games like Halo, Bulletstorm, F.E.A.R., Shadow Warrior, and Rage, all wonderful shooters, and I got to check out a ton of great new ones, like Betrayer, Wolfenstein: The New Order, Titanfall, and Destiny. Sure, these games have their weaknesses—name me a game that doesn't—but in all of them, movement and shooting is sublime. So hey, if you're out there wishing you had shooters more interesting than the new Borderlands, give them a shot. You'll have a blast.